OmniSaber™ is a wireless version of our luxeon controller Crystal Focus Saber Core. 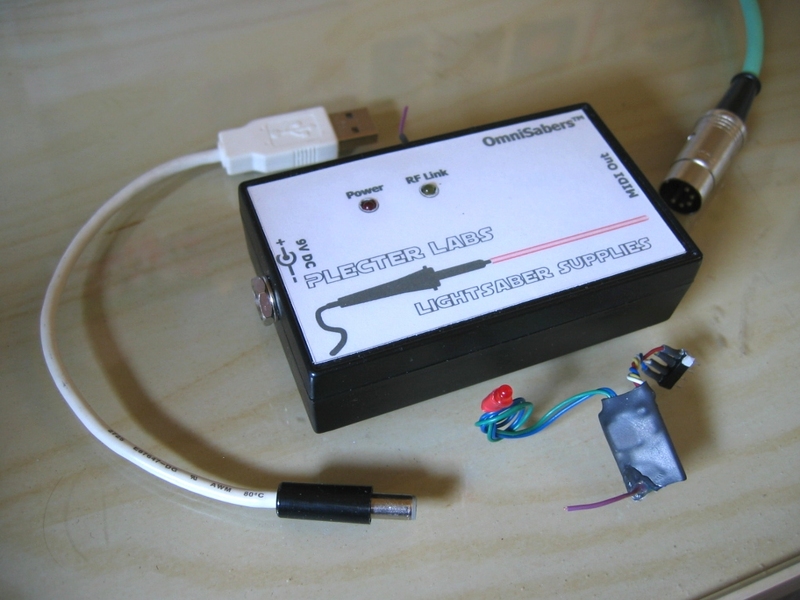 Using a miniature digital radio transmitter, it transmits the saber gestures detected by the board to a computer (windows PC, Macintosh version under development). Just like Crystal Focus Saber Core, the gestures are computed and recognized within the hilt, with a very low latency. A specific receiver sends those "orders" to our custom software through a MIDI link to play CD quality sounds the user has selected (MIDI interface not provided). This solution is the perfect one for professional performers doing choreographied fighting because it allows to play the saber sounds on a sound diffusion system that covers the whole stage or place : immersion is guarantied ! Our system of course features all the recent developments and innovations of Crystal Focus Saber Core, like blaster blocking or blade lockup using the aux. button. The software also gives the possibility to play a sound track during the performance (WAV or MP3). Easy navigation inside the sound track for the rehersals. A RF Link LED is attached to the emitter AND the receiver to diagnose easily the state of the wireless link (connected / off-line). Our base version of the software handles 2 sabers and the soundtrack but it can be adapted on demand to handle more sabers (up to 16) or to be working with professionnal samplers like HALion. The module can also be used to play in-the-hilt sounds. Power Supply : 3.3V to 9V DC max (saber module & receiver) - 3.3V (radio emitter). The receiver can be powered on a USB port (power supply cable provided).